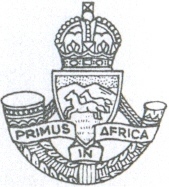 The South African 2nd Infantry division included the 1st battalion of the Royal Durban Light Infantry which was a mechanised infantry regiment. As a reserve unit, it had a status roughly equivalent to that of a British Territorial Army unit. The division fought and was captured at the Battle of Tobruk while fighting as part of the British 8th Army. This infantry division was formed on 23 October 1940 and took part in the Western Desert Campaign and at Tobruk between 20 June 1942 and 21 June 1942. On 21 June 1942 two complete infantry brigades of the division (save for one Brigade) as well as most of the supporting units were captured by German and Italian forces at Tobruk. The number of South African prisoners taken has been recorded as 10,772.